The angular-seed project on GitHub is a great way to start playing with AngularJS. 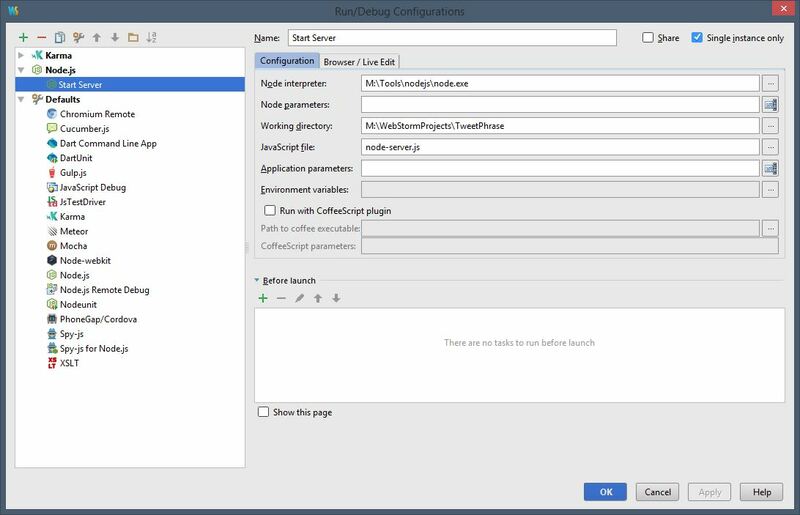 It allows you to get an AngularJS single-page web app up and running very quickly. If you want to run your web app with NodeJS then you will need to create a basic Node server. I will attempt to explain how to create a Node server configuration using some common Express framework components. The angular-seed project provides a common application folder structure and basic configuration files for some popular development tools including NPM (package manager), karma (for unit testing), protractor (for end-to-end testing) and bower (a client-side package manager). package.json – This file is used by NPM to understand the project and its dependencies. Check out the devDependencies section… do you recognize any of those? bower.json – This file is used by Bower to understand the application and the dependencies that are required in the browser to run the application. You should see a bunch of AngularJS dependencies. app/index.html – This is the basis of your single-page web app, notice that there is quite a bit of HTML and wiring already done for you. app/app.js – This is where the root module for your AngularJS application is defined. app/bower_components – This folder contains all the bower dependencies required at runtime by your application. Wondering how these components got here? When your ran npm install the package.json file contained a postinstall instruction to run bower install which read your bower.json file to determine which components needed to be downloaded and added to this folder. Have I lost you yet? Notice that this file defines the port on which the server will run (3000) and the directory from which files will be served (app). Give this configuration a name. Make sure the configuration points to the Node.exe installed on your machine and the node-server.js file you just created. A new Run view will open at the bottom of your WebStorm window and you will start to see console output indicating your server has started listening on port 3000 (the same message that was defined at the end of the node-server.js file). The final and ultimate test is to actually launch your application in the browser and see it in action. Open up your favorite browser and navigate to http://localhost:3000 to take a look. The process for setting up a basic AngularJS app using angular-seed and running on a NodeJS server is fairly straight forward. If you are not familiar with the tools, modules and frameworks that are being used to make this all work then you might still be a bit mystified as to how everything is actually working… and that is to be expected. So what can you do about it? Start changing things… enhance… break and repair. Oftentimes this is the best way to learn. Estoy entusiasmado de encontrar articulos donde ver informacion tan util como esta. Gracias por poner este post.